PAGASA weather advisory today as of 5 A.M on Good Friday, Typhoon Chedeng (international name: Maysak) has slowed down but still it has a strength while moving northwest at 15 kilometers per hour (kph). Bagyong Chedeng was packed with 75 kph maximum sustained winds and gusts of up to 210 kph and spotted at 970 kms east southeast of Virac, Catanduanes as of 4 p.m. According to PAGASA forecaster Jun Galang, "slowing down of the typhoon could affect its direction or wind strength," said at the press briefing. The typhoon was expected to make landfall on Aurora-Isabela eastern coast this Eastern Sunday then traverse northern Luzon and will exit on Ilocos Sur on Monday afternoon. 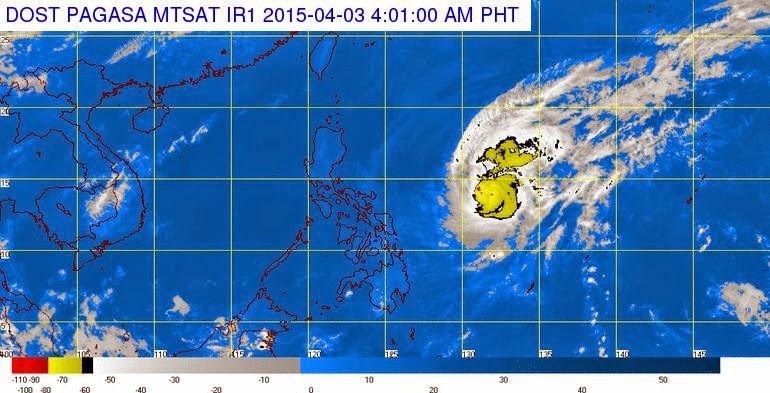 PAGASA may raise storm signal no. 1 on the area of Bicol provinces on Thursday evening if ever the typhoon change the current direction. Good thing that on Eastern Luzon, they will still experience good weather today, April 3, according to Galang. PAGASA expecting Bagyong Chedeng to weaken further as it moves slowly towards the eastern seaboard of Luzon, according to ABS-CBN News. The Hawaii-based Joint Typhoon Warning Center (JTWC) has already downgraded the status of Chedeng from "super typhoon" to a "typhoon". Comments or suggestions about "Bagyong Chedeng slow down but maintained strength (April 3)" is important to us, you may share it by using the comment box below.